Southeast Bank Job Circular 2019 will be publish in national daily newspaper. 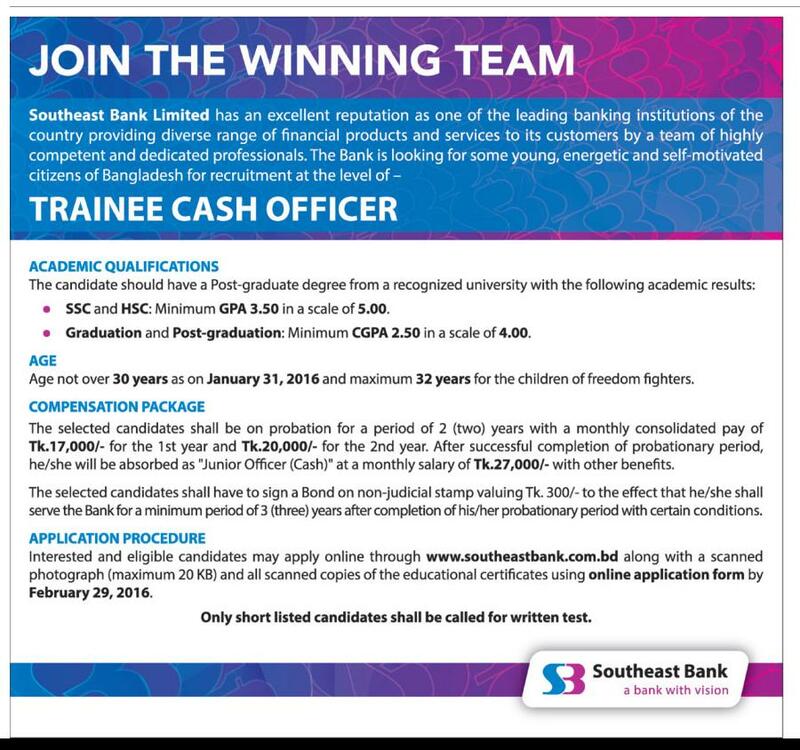 The authority of Southeast Bank Limited has been requite some Trainee Cash Officer. Recently they are announce a job requirement notice in their official website and local national daily newspaper. If you are eligible and interest for this job then apply now. You can apply this job from our site or Southeast Bank official website. You can also found here exam result and other information. Southeast Bank Limited has an excellent reputation as one of the leading banking institutions of the country providing diverse range of financial products and services to its customers by a team of highly competent and dedicate professional. If you are eligible and energetic, self motivated citizens of Bangladesh then apply now. Note: Only short listed candidates shall be called for written test. Academic Qualifications: The candidates should have a post graduate degree from a recognized university with the following academic results. Age Limit: Not more than 30 years as on January 31, 2016. ( 32 years for freedom fighter sons). Compensation Package( Salary) : The selected candidates shall be on probation for a period of 2 years with a monthly consolidated pay of Tk.17000/- for the 1st year and TK.20000/- for the 2nd year. After successful completion of probationary period, finally he/she will be absorbed as “Junior Officer Cash” at a monthly Salary of Tk. 27000/- with other benefits. Finally the selected candidates shall have to sign a Bond of non judicial stamp valuing Tk.300/- to the effect that he/she shall serve the Bank for a minimum period of 3 years after completion of his/her probationary period with certain conditions. Application Procedure: Interested and eligible candidates may apply online through www.southeastbank.com.bd along with a scanned photograph (maximum 20 KB) and all scanned copies of the educational certificates using online application form by 29th February. If you are a existing user then login. If you are a new user the click create new account and follow the instructions. Finally any kinds of problem than communicate the Bank authority. Southeast Bank Trainee Officer Job Circular 2019. The application process will be end 29th February. So apply as soon as possible. If you are search any kinds of job news, exam news or exam result news than you will come right place. We provide all kinds of job, admission, exam, result news in Bangladesh. You can also like or follow us from Face Page, Google+, Twitter, Myspace etc. If you face any problem then contact with them. You can also inform us. We are try to give you solution. As a result you can get any support about this job. When they are published result we are update it here. Recently they are published written exam result. We are also upload it here. You can see here viva exam date and result. So, stay with us for getting latest news. Finally you can get all information about this job. As a result you don’t visit another website.